Young kids learn best through play. 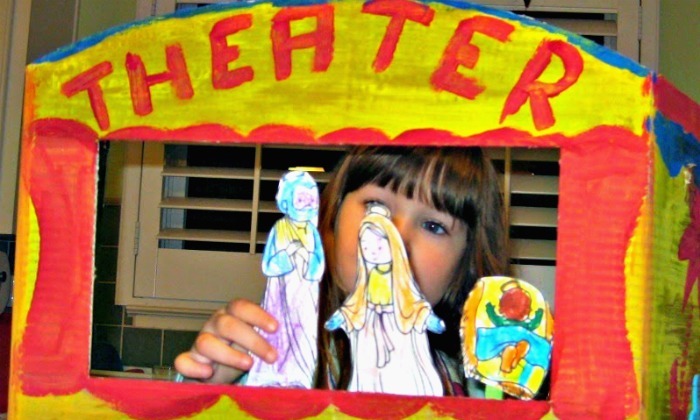 Perhaps the best way for kids to remember the Nativity story is to reenact it in their own way. This post was updated on November 18, 2014 with new graphics and links. Disclosure: I am an Amazon associate and this post contains affiliate links. For full disclosure, please click here and thank you for supporting my blog! We are not a religious family, but I think that even secular people should know Nativity story, just as they should know the Exodus story or how Muhammad received revelations from God. However, these stories are complex, with a lot of uncommon names and references to faraway places, so it’s hard for preschoolers to “just learn” them. The fact that they are usually only focused on once a year doesn’t help making them part of their “common knowledge”. Christmas books certainly help making Nativity story more accessible. My 4 year old really enjoyed A Baby Born in Bethlehem by Martha Whitmore Hickman illustrated by Giuliano Ferri. I like this particular book, because it closely follows “canonical” Bible story, but retells it in a simpler language appropriate for preschoolers. After we read this book, I encouraged my 4 year old to replay Nativity for me. Smarty got this Playmobil set with Three Wise Kings last Christmas, and it has seen a lot of action this year, as she set to reenact Nativity story. She added some Lego and Duplo bricks to make a crib for baby Jesus. Some parts from our Playmobil farm set also got into play – I think Mary (on the left near the stable) looks rather chick in her farmer outfit. Smarty played different scenarios from Nativity for several days also branching into her own pretend play. Unexpectedly, my non-arty 4 year old is a lot more interested in coloring nowadays even though she is still not bothering much with coloring neatly. Since we are doing online Advent with Activity Village, she noticed nativity coloring pages there and asked me to print her some to color. We had a lot of discussions about different characters as she was coloring them. She knows the nativity story, but it’s not reinforced all the time as in religious households, so a lot of her questions and comments really cracked me up: Why does baby Jesus have straw in his baby carrier? Why do they all have hangers (haloes did look like they were supposed to be used for hanging these figures) over their heads? Where are Mary’s legs? Why does she wear such a long dress? Why do angels have arms and wings? What is your favorite book about Nativity? Follow my Christmas Pinterest board. Follow Natalie Planet Smarty Pants's board Christmas on Pinterest. I like the baby carrier question - very cute! We usually stick with the Bible for telling the Nativity events, so we don't get all the story extras thrown in. But, I do like Exclaim Entertainment's The Very First Noel - still our favorite Christmas movie. Oh my goodness, that is the cutest. I love all her questions and her retelling of the Christmas story. Glad to see she is enjoying coloring now. I love the way she retold the story! So cute and funny! I love her questions too. I love her reteling and that puppet theater is AWESOME! I love all of this, from her questions to her retelling the story. She did a very good job with her puppet play! I love it! I think she got the main points of the story down. I should probably pull out a book to tell the main story to M this year. She sees nativity scenes and says she loves baby Jesus, but I'm not sure she really has any idea who he is! She really absorbed the story, didn't she? Fun to do a puppet retelling. The puppets and stage are so great! Love all the colors on the stage. The book sounds great. I will have to look for it. Oh Natalie, her remark about the baby carrier is priceless and her retelling of the story is definitely one of a kind:-). Her puppets turned out wonderfully! I like her theater too. Love her puppet theater. She's getting great gifts for Christmas too:) I'm always impressed by how well she retells stories. This is amazing...I love the puppet theater and her questions and retelling. What a great project thank you so much for sharing and linking up to stART!